TRAIL MAGIC nominated for Emmy -- Eden Valley Enterprises News! 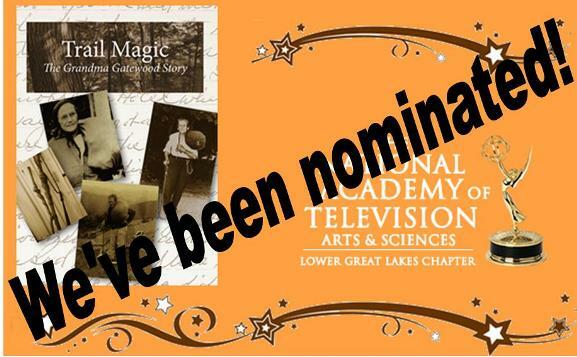 We are so excited to announce that our film Trail Magic, the Grandma Gatewood Story was officially nominated April 27th for a Regional National Association of Television Arts and Sciences (NATAS) Emmy Award in the Best Documentary, Historical category. Produced by Bette Lou Higgins of Eden Valley and directed by Peter Huston of FilmAffects, the story of Emma Gatewoods solo thru-hike on the Appalachian Trail in 1955 at the age of 67 (after raising 11 children and surviving domestic abuse) still resonates with hikers and people from all walks of life. The film captures Emmas challenging life that led to her historic journey on the A.T. Her hike and the subsequent publicity spurred interest in trail hiking across America. According to Peter Huston, Emmas story propelled boomers in the late 60s and 70s to get out in nature and many chose to attempt the Appalachian Trail. The film explores the idea of Grandma (Gatewood) on the trail and how that changed the way we look at personal fitness and outdoor adventure. The documentary features Appalachian Trail Conservancy CEO Ron Tipton and other ATC staff and was first shown in May, 2015 at TrueNorth in Sheffield Village, Ohio to two sold out houses! Since then it has been shown to the AT Communities gathering in 2015 and first aired in Ohio on PBS TV stations WVIZ and WOUB in 2016. It has being distributed to PBS stations across the country by National Education Television Association. (Check with your local PBS station to request it -- a sample request letter is available). You can purchase a DVD of the documentary or storytelling program or contact us to arrange a presentation of these or any of our programs.